Enjoy the top 1 famous quotes, sayings and quotations by Jenny Daggers. 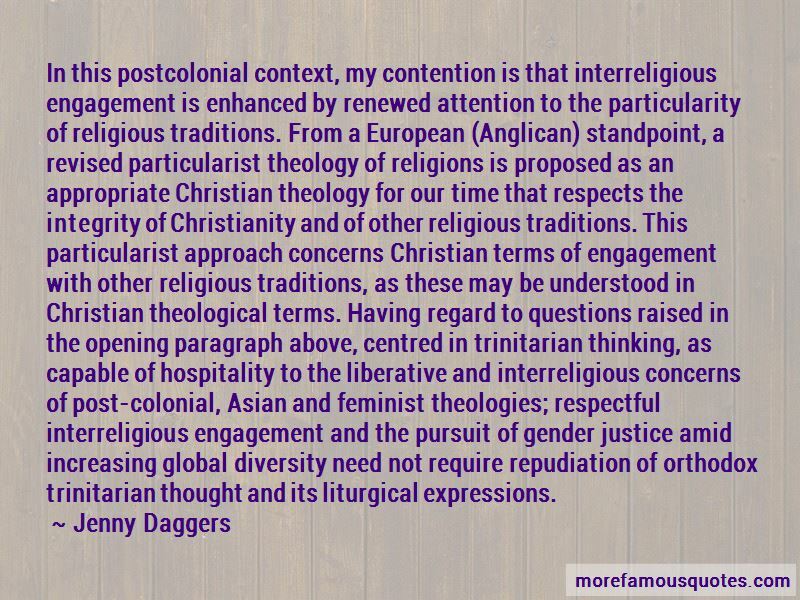 In this postcolonial context, my contention is that interreligious engagement is enhanced by renewed attention to the particularity of religious traditions. From a European (Anglican) standpoint, a revised particularist theology of religions is proposed as an appropriate Christian theology for our time that respects the integrity of Christianity and of other religious traditions. This particularist approach concerns Christian terms of engagement with other religious traditions, as these may be understood in Christian theological terms. Having regard to questions raised in the opening paragraph above, centred in trinitarian thinking, as capable of hospitality to the liberative and interreligious concerns of post-colonial, Asian and feminist theologies; respectful interreligious engagement and the pursuit of gender justice amid increasing global diversity need not require repudiation of orthodox trinitarian thought and its liturgical expressions. Want to see more pictures of Jenny Daggers quotes? Click on image of Jenny Daggers quotes to view full size.